Fair Justice for Persons with Mental Illness: Improving the Court's Response This Guide is intended to be a practical tool for convening and developing protocols focused on working with justice-system involved individuals with mental or behavioral health issues. However, given the national focus on opioid abuse and 70,000+ overdose deaths in 2017, this Guide can and should be extended to those with co-occurring disorders. The Guide focuses on highlighting the important steps of convening stakeholders, assessing the mental health landscape, and implementing court and community responses and strategies. Fill the Gap Annual Report Efforts sought to increase safety created a backlog in the rest of the criminal justice system. In essence, funding targeted the front and back of the criminal justice system, creating a "gap". Funding for those entities in the "gap" did not keep pace. The Fill the Gap initiative was intended to address this problem. This report was compiled from a review of the literature on court facility funding, and information provided by court administrators and consultants from the National Center for State Courts. Arizona's Court System Guide Describes how the courts are organized, the special functions of the courts and how court cases are processed in our legal system. Self-Service Forms Center Provides information and forms for persons who are representing themselves in court. The information is intended to help you help yourself through the court system. CASA Links to articles and publications to assist with Court Appointed Special Advocates (CASA) advocacy efforts. Juvenile Justice Services The Juvenile Justice Services Division regularly produces manuals, publications, reports and research material. 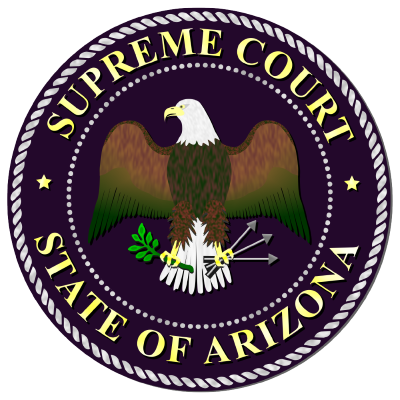 Arizona Supreme Court Opinions From these web pages you can view the most recent Opinions and Memorandum Decisions released by the Arizona Supreme Court. AZCourtHelp.org Coconino County Court assisted in spearheading the development of the website in conjunction with their Virtual Resource Center, Legal Talks, assisted by the Attorney General’s Office, the State Library of Arizona, and Department of Economic Security. Court Locator Locate a court by county. Jury Service Info The right of a trial by jury is the privilege of every person in the United States. The right is guaranteed by the U.S. Constitution and Arizona Constitution. Use this link if you have been called for jury duty. Note: the Arizona Supreme Court does not have jury trials. Our Courts AZ Our Courts Arizona is an interactive civics program aimed at adult groups. Our Courts Arizona uses easy to understand, non-partisan, interactive sessions. They are taught by current and retired judges who engage the audience and provide information about the importance of fair, impartial, and accessible courts and the rule of law. Victim Rights Arizona’s Constitution provides victims the right to receive prompt restitution from a person convicted of a crime against them. Judges must order the convicted person to repay all of the victim’s economic loss, as determined by the court. See A.R.S. § 13-603. Law for Kids An educational resource explaining Arizona laws affecting kids in understandable terms. Law for Seniors Law for Seniors touches on some of the topics that seniors (65+) may face and offers contact information for agencies and organizations that may be of assistance to you or your loved one. Law for Veterans Information for military connected individuals and their families; resources for veterans and active service members as well as resources for advocates.